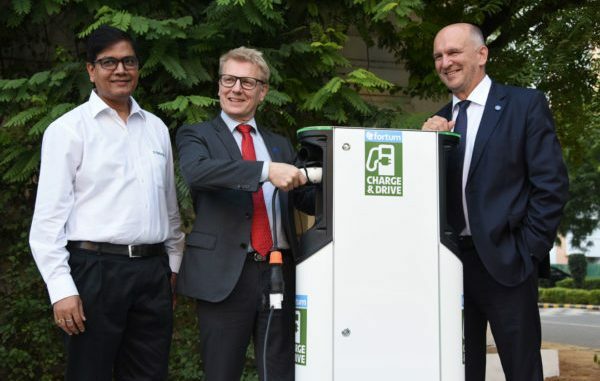 Helsinki-based clean energy company Fortum has announced timely and invigorating news for electric mobility expansion and the development of electric vehicle charging infrastructure — across the vast country of India. India has only about 6,000 electric cars, but it is looking to swiftly move forward and actually aims to be the first fully electric car nation. The goal is to have only electric vehicles on the market by 2030. Whether you think the target is viable or not, there must be immediate opportunities for EV infrastructure leaders. Fortum Charge & Drive — which will be involved in our coming Cleantech Revolution Tour conference and is part of our working group to create EV charging guidelines for cities — has stepped in to help electrify the country’s transportation fleet. The company already has a network of 1,480 smart chargers in Europe, out of which 500 are DC quick chargers, but it recently jumped quite far from there to sign a Memorandum of Understanding (MoU) with NBCC, a blue-chip Government of India Navratna Enterprise under the Ministry of Urban Development. The MoU commits to the development of charging infrastructure in the country. CleanTechnica’s Saurabh Mahapatra, based in Delhi, India, reported earlier this week that Mahindra & Mahindra would invest over $600 million into electric vehicles and launch electric versions of existing crossover sport utility vehicles shortly. The Fortum and NBCC infrastructure plans and agreement will cover all significant activities in the value chain: Planning, designing, investment, and operation of the charging infrastructure using a cloud-based system.